Quick Study: Elena Chizhova writes novels that address historical, social, and religious questions. The Chizhova File: Elena Chizhova was first published as a fiction writer in 2000, when her novel The Children of Zaches—about a teacher who starts a Shakespeare club for her students—came out in the journal Zvezda. 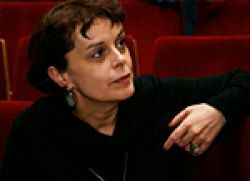 Chizhova has gone on to write several more novels, one of which, The Time of Women, won the 2009 Russian Booker Prize. The Time of Woman has been translated into English and other languages and adapted for stage. Two earlier novels by Chizhova—The Criminal and The Monastery—were shortlisted for the Russian Booker prize. Chizhova also occasionally writes for the journal Questions of Literature and is director of the St. Petersburg PEN Club. Psssst………: When Chizhova worked as a teacher and researcher at a finance/economics institute, she “lived a double life” by researching literature at night… She worked in the ‘90s as an assistant to the general director of a large furniture factory… Chizhova spent her Russian Booker prize money on a new car, which she said was a planned purchase. Chizhova’s Places: Born in Leningrad, lives in St. Petersburg. Chizhova has said she doesn’t consider herself a “Petersburg writer”—she thinks of herself as a person who was born in the city and lives there, though she also thinks of herself as a European person, saying the Moscow-Petersburg/Leningrad conflict is nothing but an old literary myth. Chizhova Recommends: Chizhova said on the Echo of Moscow show “The Book Casino” that when she was a teacher she studied literature in her spare time, beginning with Plato and Aristotle. In a 2011 interview with Questions of Literature, Chizhova said she could recommend a list of recent books with a clean conscience; the Russian books were Pavel Basinsky’s Leo Tolstoy: Flight from Paradise, Elena Katishonok’s Once There Lived an Old Man and His Wife, and Eduard Kochergin’s Angel’s Doll. Chizhova also said the only contemporary writer for whom she feels a true kinship is Orhan Pamuk.